94 mins. Rated R for strong brutal graphic violence, gory images, language and some drug content. I’m hardly the first person to see Green Room. It premiered last year at Cannes to solid reviews. But, I was lucky enough to be a part of an advance screening last night, and let me tell you, it was worth it. Green Room is the story of a band called “The Ain’t Rights” as they, desperate for income, pick up a quick gig near Portland, which they quickly discover is a skinhead Neo-Nazi bar. When Pat (Anton Yelchin, Star Trek, Burying the Ex) goes back to the green room to collect a cell phone, he unknowingly stumbles upon a horrific scene, and now, he and his bandmates are in for the fight of their life, holed up in the green room as the skinheads, led by Darcy Banker (Patrick Stewart, TV’s American Dad, Ted 2) attempt to tear them apart in order to cover their tracks. 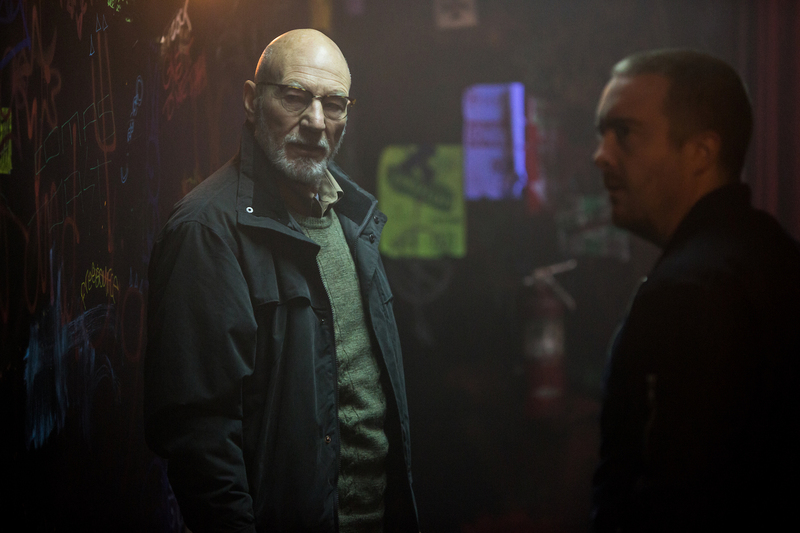 Green Room is absolutely intense during the entirety of its 94-minute runtime. I found my hands shaking and sweating as I reeled in my seat. Anton Yelchin is a great lead as the de facto brave leader of the band. His guttural performance left me with chilled to the bone. On the other side, Patrick Stewart plays a monster in a man’s body as the ruthless villain Darcy. He gives such a creepy and nuanced performance without falling into cliché. Imogen Poots (Need for Speed, Knight of Cups), who also appeared with Yelchin in the Fright Night remake a few years back, plays Amber, another witness to the murder in the green room, and she finds herself joined up with The Ain’t Rights for survival. Poots gives great work as Amber and provides an uneasiness to her unhinged character. I saw director Jeremy Saulnier’s early film Murder Party, and while it has been some time, I recall enjoying that one quite a lot, though in tone the two films find themselves somewhat distanced. Saulnier’s screenplay gives out some awkward chuckles that relieved me in between the moments of sheer animosity. Even with the comedic elements, the shock and horror felt unrelenting. The faults with the film line up with a simple setup made somewhat more confusing at the beginning. It took me a bit longer than it should have to put the pieces of this film in place, but it didn’t detract from my viewing. 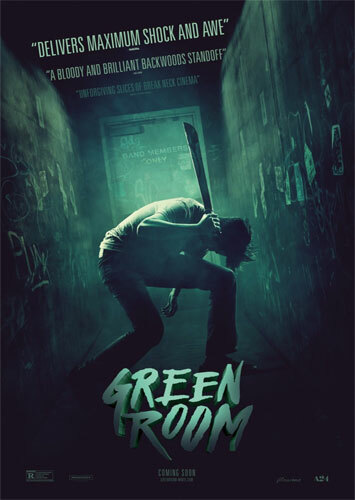 I’m happy to say that Green Room is one of the best horror films I’ve seen in a theater in some time. I really enjoyed myself and cannot wait to see what this filmmaker has next. His use of top notch performances with a terrifying environment in a film I’m not sure I can even compare to another. It was a great time at the movies and an exhilarating experience overall.